432 Park Avenue will officially top out next week, making it the tallest residential building in the Western Hemisphere (for now). The 1,396-foot-tall development by Macklowe Properties and Los Angeles-based CIM Group will formally reach its apogee on Tuesday, when the final concrete for the highest floor is poured, Crain’s reported. Designed by Rafael Vinoly, the 96-story, 104-unit paean to luxury flaunts views of Central Park, the Hudson and East Rivers, Atlantic Ocean and probably the Great Wall. The building’s most expensive unit on the market, Penthouse 94, is a full-floor, 8,255-square-foot six-bedroom asking $82.5 million. That’s $9,994 per square foot. The interiors by Deborah Berke include 12’6″ ceilings, private elevator landings, service entrances, windowed eat-in kitchens with Miele stainless steel appliances and master bedroom suites with two bathrooms plus adjoining dressing rooms. All windows measure 10′ by 10′, all the better for residents to soak in the vistas. The master bathrooms are fitted in book-matched slabs of Italian statuario marble with marble vanities, radiant heated floors and perhaps the most handsome freestanding soaking tubs in existence. Also available for purchase are staff suites, office suites, climate-controlled wine cellars and storage units. Two weeks ago, 432 Park made headlines (well, it’s always making headlines) when 17-year-old urban explorer Demid Lebedev scaled to the pinnacle during the night and took several vertiginous shots. Intrepid teenage daredevils aside, 432 Park’s reign at the top will be short-lived. 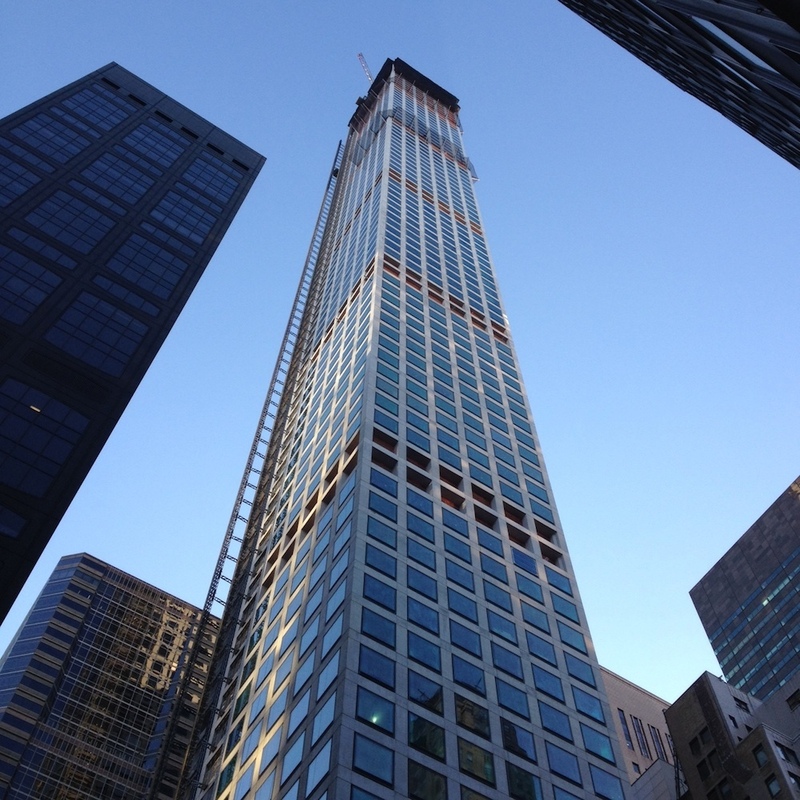 JDS Development’s 111 West 57th Street project will rise a reported 1,400 feet tall. Nearby, Extell Development’s Nordstrom Tower at 225 West 57th Street will eventually soar 1,775 feet tall — just one foot shorter than the 1,776-foot-tall One World Trade Center.